A large tree, reaching heights of 85 metres on the coast and 42 metres in the Interior. Older trees have a long, branch-free trunk and a short cylindrical crown with a flattened top. There are two varieties of Douglas-fir - coastal and Interior. Needles are flat with a pointed tip. The upper surface is bright yellowish-green with a single groove down the centre; the lower surface is paler. The needles appear to stand out around the twig. 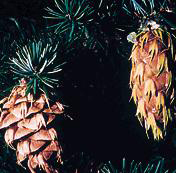 Cones are 5 to 11 centimetres long, turning from green to grey as they mature. Between each scale, long three-pronged bracts are easily seen. Seeds are winged at the tip. 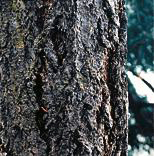 Smooth, grey-brown, with gummy resin-filled blisters when young, the bark becomes very thick with age and deeply grooved, with dark reddish-brown ridges. The coastal variety of Douglas-fir occurs along the southern mainland coast and across Vancouver Island, except for the very northern tip. The Interior variety occurs throughout southern British Columbia and north to Takla Lake. 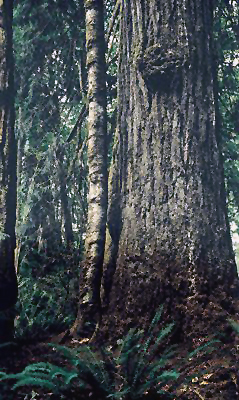 The two varieties of Douglas-fir occur in quite different ecosystems. The Interior variety grows in a variety of habitats including open forests with pinegrass and mosses beneath. On the coast, the forests are much more productive. Douglas-fir can grow with western redcedar, hemlock, and grand fir, with a lush layer of salal, huckleberries, Oregon-grape, and sword fern beneath. Aboriginal people in the south part of the province had many uses for Douglas-fir. They used the wood and the boughs as fuel for pit cooking. They also used it for fishing hooks and for handles. Douglas-fir boughs were frequently used for covering the floors of lodges and sweat lodges. Douglas-fir wood has been highly valued since the first Europeans exported lumber in the 18th century. This dense wood is exceptionally hard, stiff and durable. Its strength and availability in large dimensions make it outstanding for heavy-duty construction such as wharves, trestles, bridge parts and commercial buildings. Because the Douglas-fir is not a true fir, the common name is hyphenated. It was named after David Douglas, the Scottish botanist who introduced many of British Columbia's native conifers to Europe.